Where are my fellow cranberry lovers? I confess I made cranberry sauce a couple weeks ago and have had an ongoing supply in my fridge since to put with oatmeal, yogurt, pancakes, waffles, parfaits, pretty much any way I can eat it I will. Cranberries are probably my favorite “Thanksgiving” food. 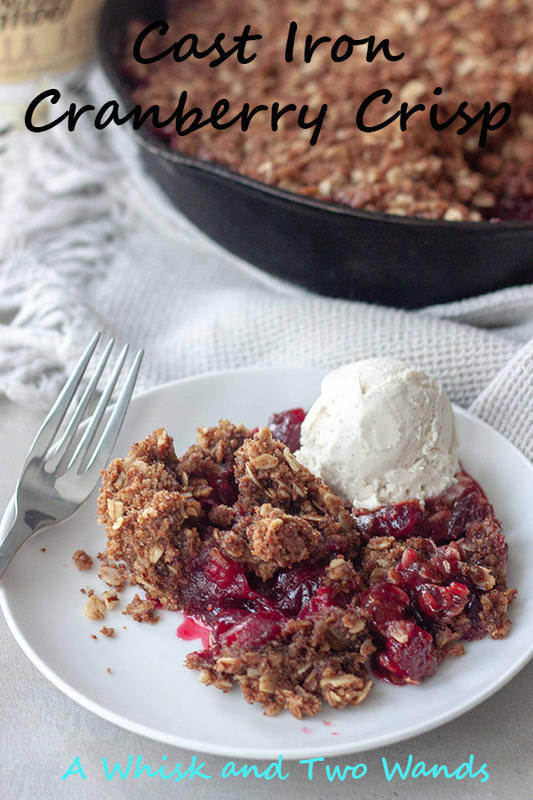 Today I’m sharing a real simple and delicious Cast Iron Cranberry Crisp you can make quick and enjoy for Thanksgiving dessert, or if you’re like me you’ll also love it for breakfast! Where has the time gone this year? I can’t believe Thanksgiving is only 10 days away! Still not sure what to make if you like cranberries this is it. It only requires a few basic ingredients and is gluten free and vegan friendly. If you don’t have a cast iron pan you can make this in a casserole dish or standard 8×8 or 9×9 ceramic pan. 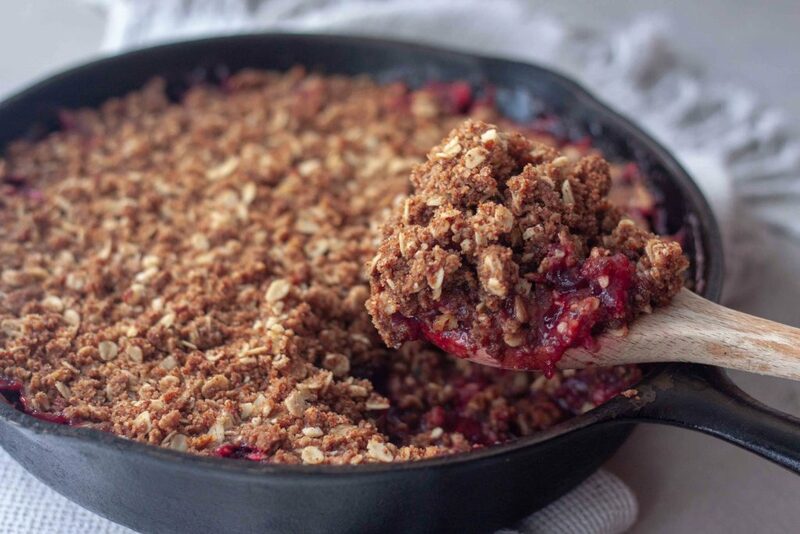 Cast iron just makes it simple to make the cranberries, sprinkle the crumble topping on, and throw in the oven without a lot of extra clean up. 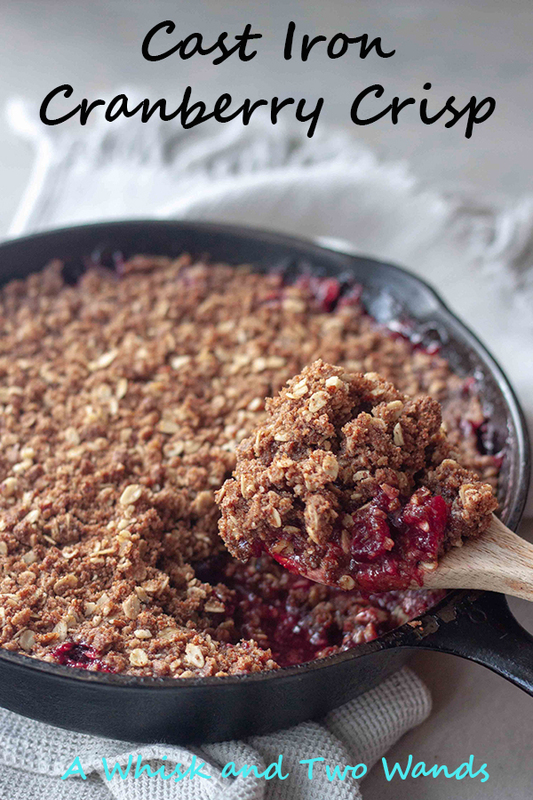 I could eat a whole pan of this Cast Iron Cranberry Crisp myself. The perfect ratio of slightly sweetened tart cranberries with that sweet crumble topping, so good! Not that I need any reason or justification to eat them but cranberries are full of antioxidants, and high in vitamin C and fiber. and high in vitamin C and fiber. They also fight inflammation, reduce the risk of heart disease, and help prevent ulcers and yeast infections and may help prevent cancer. I did try to make it with muesli like my Cast Iron Apple Crisp as it’s a grandma approved healthier version of the classic but the muesli I wanted to use didn’t work well as the dried fruit burnt. 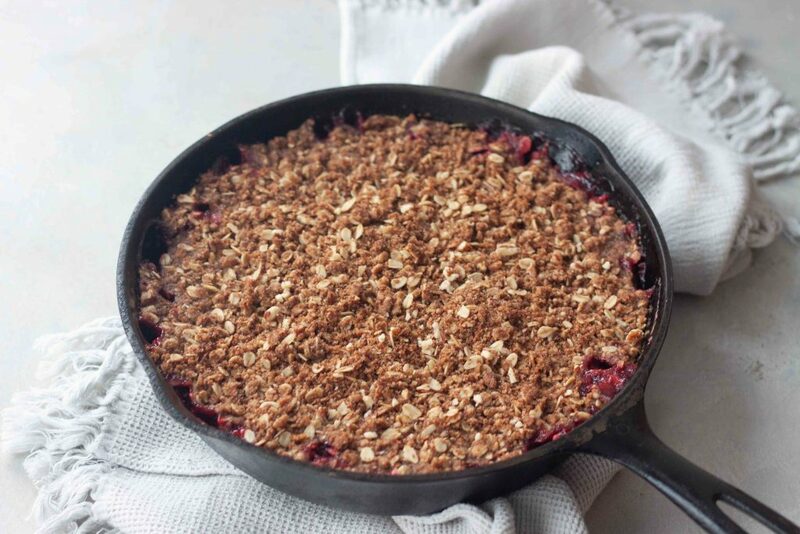 I’m going to play again because while I was enjoying some Cranberry Crisp this past week I got a crazy idea to use a different flavor of muesli that would totally transform this Cast Iron Cranberry Crisp! I’m hoping to try it this coming weekend and will share on Instagram if I do since I know I would be able to contain myself if it’s as good as I think it will be. If you aren’t a fan of cranberries you can always do half apples and half cranberries. I almost made some last week but Cran Apple Juice kept popping in my head and how much I wasn’t a fan as I just wanted the tart taste of cranberries and always found it too sweet. If making it with the apples omit the water as the apples should have enough liquid. Are you ready for Thanksgiving? What do you bring? This year will be like last year a very laid back and small Thanksgiving but I’ll still bring my cranberries. Two kinds as I can’t have my brandied cranberries this year. I also plan on bringing this Cast Iron Cranberry Crisp and maybe my Pumpkin Pie Peanut Brittle Pudding Cups. I hope to make a cranberry sourdough and I really want to make cranberry sourdough fritters for breakfast Thanksgiving morning. It will all depend on how the week goes, how much energy I have, and how a big appointment I have for baby boy goes next Wednesday. I mention in a few of my other cranberry recipes that I went to the big CranFest in Wisconsin 2 years ago for a girls trip and came back with 10 pounds of cranberries and lots of cranberry goodies. Well we went back this year with three 10 year old girls for a day trip. I didn’t get as much as it was a little struggle to haul back what I did buy while pregnant. Dear daughter A did find some fun and crazy dried cranberry flavors she got for snack like watermelon. If you love cranberries as much as I do check out some of my other cranberry recipes here and here. 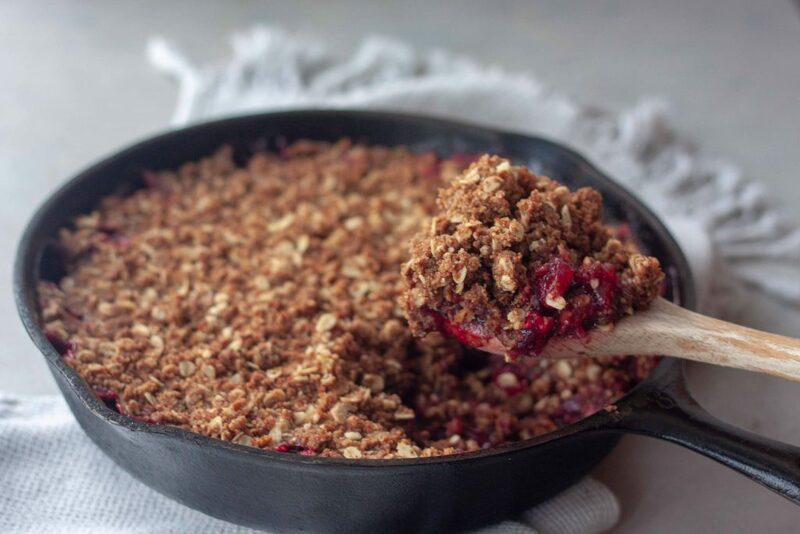 Simple and delicious Cast Iron Cranberry Crisp is the perfect combination of slightly sweetened tart cranberries and crumble topping perfect that will brighten the season. Great for Thanksgiving or Christmas it's easy to make with minimal clean up. Gluten free and vegan friendly. simmer for 10 minutes while making the topping stirring occasionally. Shut heat off after 10 minutes. To make topping grind, or chop, pecans to a course ground texture. In a bowl mix together ground pecans, flour, oats, cinnamon, salt, baking soda, and coconut palm sugar. Cut oil/butter into the dry mixture with a pastry blender or forks until you have a coarse crumble and all the coconut oil/butter is blended in. Give cranberries one last stir and sprinkle crumble mixture evenly over cranberries. Carefully place skillet in the oven and bake for 20 minutes. Let cool 10 minutes before serving, topping with vanilla ice cream if desired. You can sub lemon zest and juice for orange zest and juice. To make in a ceramic (or glass) pan as noted in the post you can make the cranberries in a saucepan and then pour them into your pan before sprinkling with the crumble topping and baking. This looks delicious, Sarah! Yum! I love cranberries to no end. The PERFECT fall and winter ingredient! Thank you Heather! Me too, I stock up this time of year so I have them for later. Crazy I was just thinking about you and wondering how you’re doing. I was going to send a message on Instagram but not sure if you changed your username. Hope all is well. I love cranberries and my cast iron skillet! This would be great for Thanksgiving. It’s so easy I know I’ll be making it again next week. Cranberries and cast iron, have to love the simple things! I love the idea of using cranberry and oats in a dessert. Healthy and delicious! Thank you Deborah, I just can’t get enough cranberries (or apples)! I love cranberries! This sounds amazing- can’t wait to try it. Me too, and one of my obsessions right now! Crazy how I’m loving the simple things with this pregnancy and then a couple odd ones. It’s so easy, hope you enjoy it as much as I do! I need to do more baking in my cast iron! 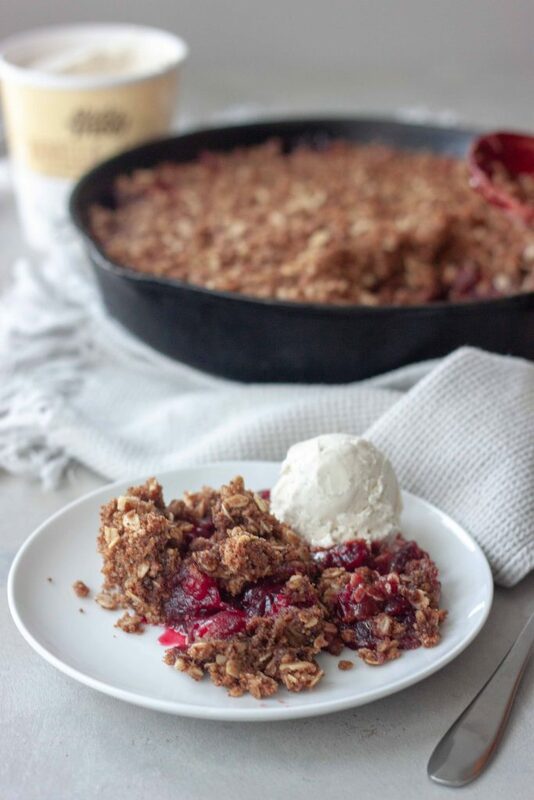 This looks great… I’ve never had a cranberry crisp but I know we would love it. I love my cast iron pan and it makes this so simple. If you like cranberries and crisps you’ll love this! 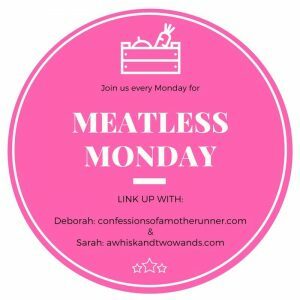 I love this idea and basically any combo of cranberries and oats! I really need to put my cast iron to more use–this looks like the perfect way to start! :D!! I really need to use my cast iron skillet more often–this looks super good! <3! I love mine, if you like caramelized bananas they are the best in a cast iron skillet! I love cranberries!! This cranberry crisp is definitely happening soon! Looks so cozy and delicious! I usually use mixed berries, I love the idea of using cranberries! This looks delicious!!! I’m a big fan of crisp and crumble desserts and usually I make them in the fall but I love making them year round with seasonal fruits. I just love Autumn Crisps and what a yummy way to use up all those cranberries too! Yes! I never seem to have enough cranberries. I was testing different cran-apple pies for a magazine recipe and the whole bites of cranberry were too tart for me, even with sweetness around it. I think I need to try something like this for my own tastes where the cranberries are simmered. I don’t need super sweet, just a little edge taken off the tart! Whole cranberries are pretty tart! Cooking them down with sugar and citrus along with the sweet crumble topping help balance it out. Yum! I love the addition of orange!